Let’s talk about Whole30 compliant drinks. 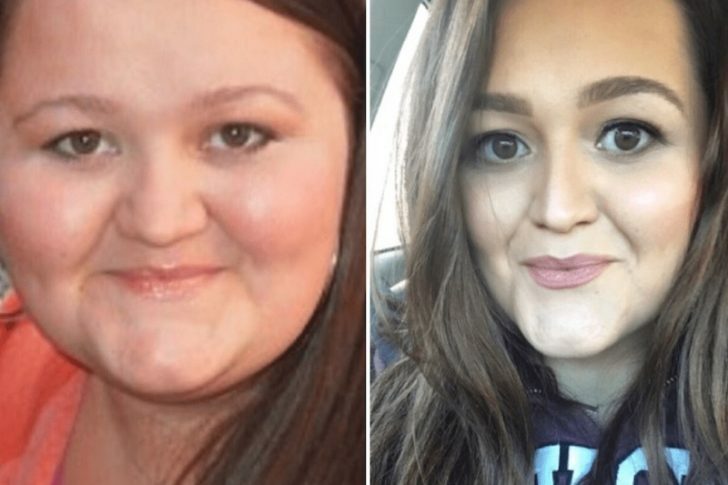 The thought of not having my daily Diet Coke or my morning coffee pumped full of overpriced milk and sugar freaked me out when I first realized that those were out when I was planning my first Whole30. I thought I was going to be drinking plain ol’ water for the next month of my life and being bored to tears by the time the thirty days were up. Good news though! 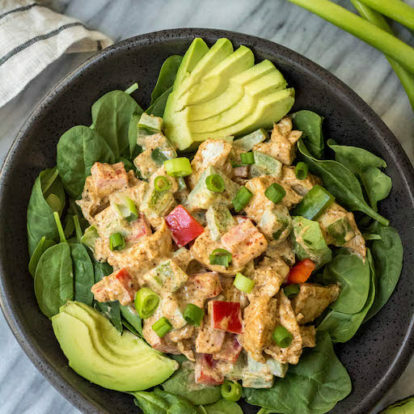 There’s lots of other options to quench your thirst while you’re doing the Whole30. There’s no less than 5,000 different types of flavored and sparkling waters on the market today. I mean, there’s an entire aisle of them at Target. 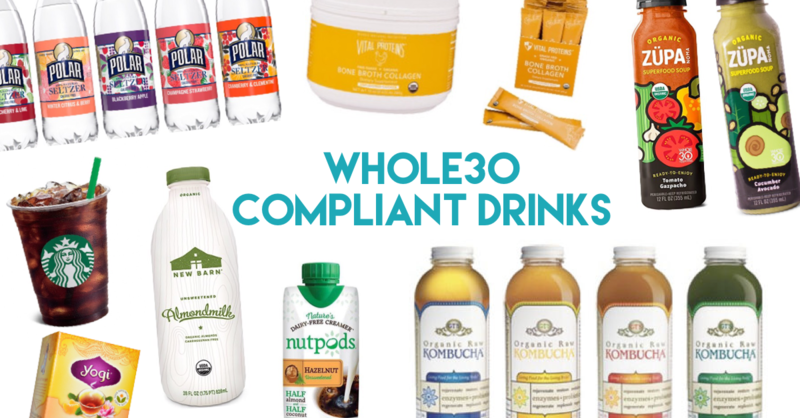 Most of them are Whole30 compliant drinks, but as with everything else, read your labels. There are some brands that have additives that are O-U-T for the program. These are some of my favorite Whole30 compliant waters. 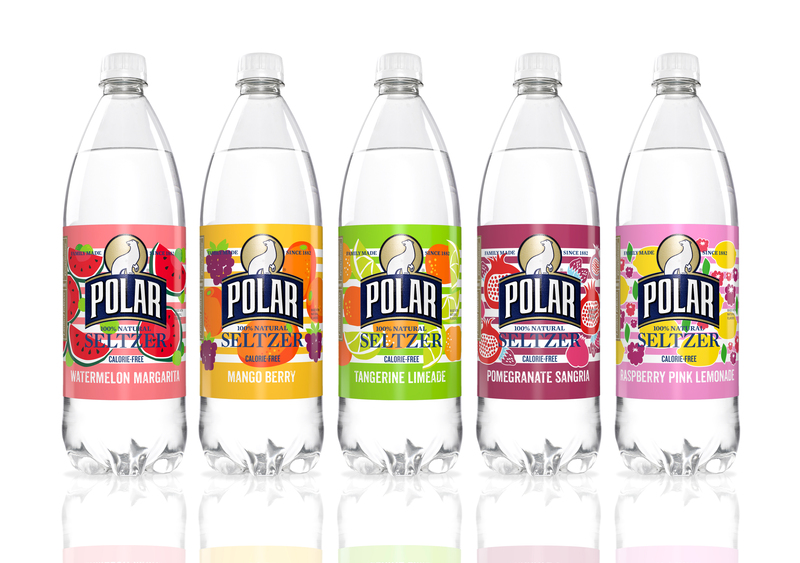 Polar carries flavored sparkling waters in large bottles or in cans, depending on where you’re shopping. They have no shortage of fun flavors and all of the seltzer water is made with just water, bubbles and natural flavors. Which is what you’re looking for when it comes to water choices other than tap for your Whole30 compliant drinks. Some of my favorite flavors are orange vanilla, cherry pomegranate, and cranberry lime. I’ve seen them at all major grocery retailers. A popular and trendy brand, LaCroix is another Whole30 compliant flavored water company. They contain no sodium or sweeteners – just natural flavoring. A lot of people swear by these and have found it easy to get over their soda habit by drinking LaCroix because they’re that good. Like Polar, there’s a variety of different flavors and I have yet to meet one I don’t like. I don’t even like coconut, but I love the coconut flavored LaCroix. Explain that. 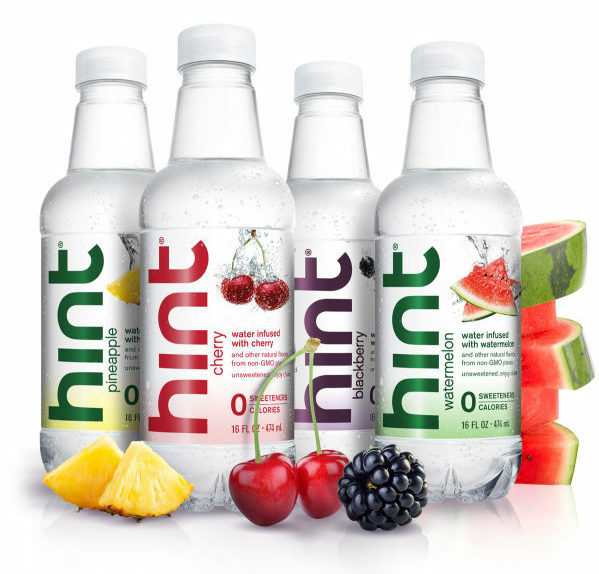 Hint isn’t sparkling water (although they do have a new line of fizzy options), but it’s a delicious flat water with, you guessed it, just a hint of flavor from a fruit infusion. 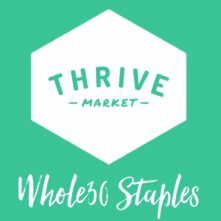 They’re an official Whole30 Approved partner and offer up a really good alternative to plain bottled water. They also have fun flavors like watermelon, peach, and blackberry. These can be found at most Targets, Whole Foods, and some other local stores. I’ve even most recently seen them in Starbucks! Target brand, Canada Dry, the Whole Foods 365 brand, San Pellegrino.. and of course, regular water with fruit, cucumbers, limes or lemons! Coconut water is also allowed on the program, but only if you grab a brand with no added sugar or additives. Vital Proteins also offers a line of flavored water with the added health benefits of collagen, like Lavender Lemon Beauty Water and Melon Mint. 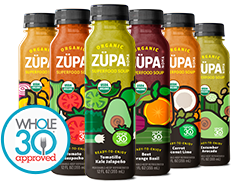 While these are obviously a little more hearty and filling than just water, I love keeping these ZUPA NOMA soups around for something refreshing and different to sip on. 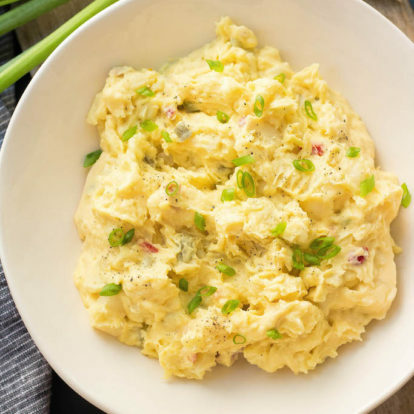 They also serve a dual purpose as a good snack, post-working mini meal, or on-the-go nutrition. All of them are Whole30 compliant drinks. Some of my favorite flavors are tomato gazpacho and cucumber avocado. If you haven’t tried these out yet, use code “PALEOBAILEY” to save yourself 15% off! Same with the sparkling waters, there’s a hundred brands that you can enjoy on your Whole30. And, same with the sparkling waters, you have to be sure to check your labels out with kombucha. Not all are compliant. Check out GT’s, Humm, Brew Dr., or Kevita. Most of these are sold in stores like Target and Whole Foods. Or, if you’re up for a new hobby, try making your own at home! Personally, I’m all for the iced black coffee. Probably because when I did my first Whole30, there wasn’t any Whole30 compliant creamer options except canned coconut milk. And that, well, that was too much work first thing in the morning. However, I know not everyone enjoys black coffee. While tea, flavored tea (check your labels! ), and matcha are allowed, it’s just not the same as coffee for most of us. 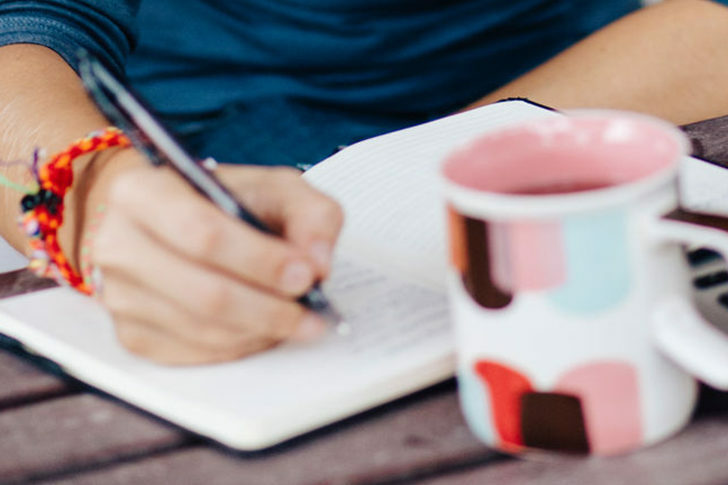 Luckily, there’s now creamer and other options for you during your Whole30. A note about tea: not all tea brands or flavors are safe for your Whole30. Some brands have flavors that are totally fine and other flavors that contain rice flour, sugar and candied fruit! My theme for this post is quickly turning into “check your labels” but, well, check your labels. Some brands that are usually safe are Yogi tea, Choice, Good Earth, Numi, and Celestial. Tip for ordering iced coffee from Starbucks: make sure you specify “no sweetener”, because they will automatically add it to black iced coffee! Another safe option is an Americano! 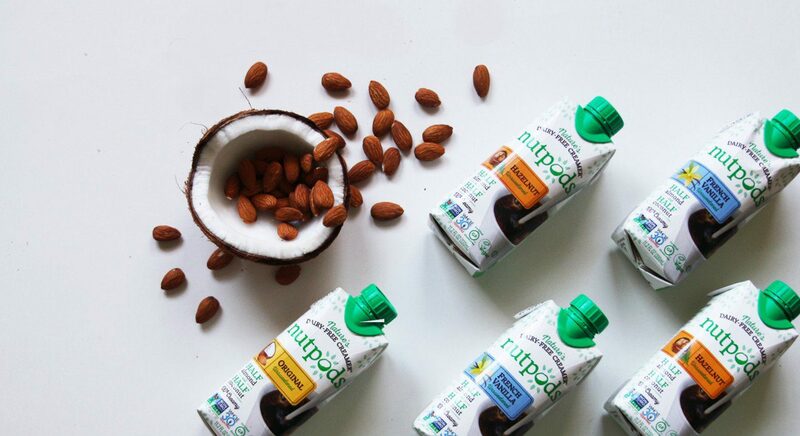 nutpods are probably my favorite coffee creamer. They’re Whole30 Approved and the company is just a GOOD company to support. Madeline (if I’ve met her once, I can consider us on a first name basis… right?) 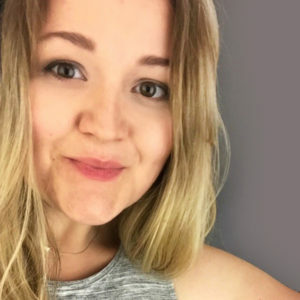 started her small business out of her need for a dairy free, additive free creamer and it’s since filled such a hole in the industry. They come in 3 different flavors – French vanilla, hazelnut and original. 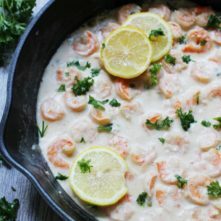 To be honest, I use the flavored ones in my coffee and keep the original flavor for cooking when I need to make sauces or add cream to soups. I love them. 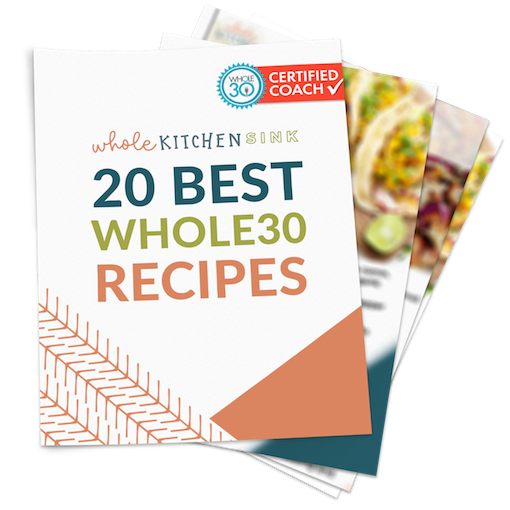 You can make your own nut milk SO easily and for a fraction of the cost of buying a healthy, Whole30 compliant option from the store. It’s a good way to be able to make your own Whole30 compliant drinks 100% at home. It’s always interesting to me how products that have LESS ingredients (like almond milk with you know, just almonds and water) cost a more than products with an ingredient list a mile long (like the almond milks with ALL. THE. ADDITIVES.). Logic says products with less things in them should be cheaper than ones with more things in them but apparently that’s just me. ANYWAY. If you want to make your own at home, don’t be intimidated. It’s seriously a simple 3-step process. Soak almonds or cashews (or hazelnuts, etc) for a few hours, blend with water, drain with a nut milk bag and done! My favorite nut milk bags are from Ellie’s Best, only because they quality is so much better than a cheaper and thinner bag I’ve purchased in the past. Even after tons of cycles in the dishwasher, they’re still in good shape. You can get them on their website and save some money using the code PALEOBAILEY, otherwise they’re available on Amazon! Sidenote: nut milk bags are also my secret to getting veggie noodles (like zoodles) that aren’t watery! 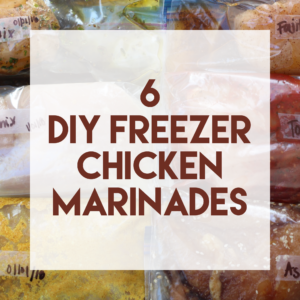 I use the bag to squeeze the excess water out without them losing their shape! New Barn is a brand that has Whole30 Approved almond milk that you can use for coffee creamer (or cream based soups, sauces, etc.) 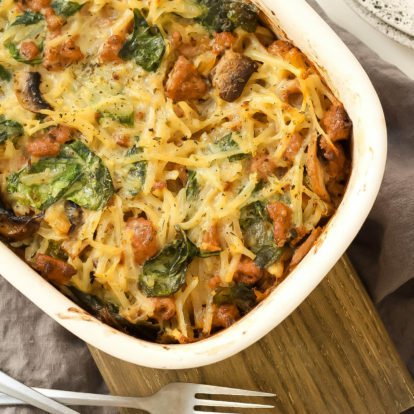 This is a great option with no scary or unnecessary additives. They’re available in Target and Whole Foods and other grocery stores that have decent healthy and natural food options. Some other Whole30 Compliant almond milk brands to use are: 365 Unsweetened almond milk from Whole Foods, Blue Diamond almond and cashew blend, Califia Farms unsweetened almond milk, Silk unsweetened almond milk and Silk unsweetened coconut and almond milk blend, SO Delicious almond milk, MALK unsweetened almond milk and Friendly Farms unsweetened almond milk from ALDI. During my first round I would have never thought of adding bone broth to a Whole30 compliant drinks list. Now it’s one of my favorites. Bone broth is a nutrient rich option to sip on that lots of people love! 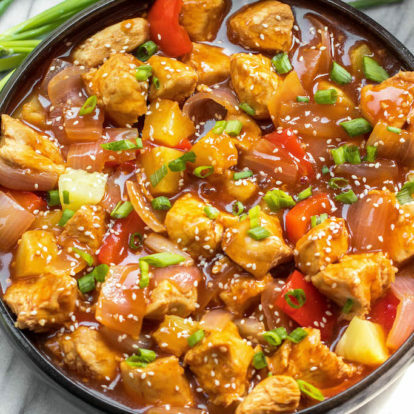 Make sure to read your labels as some broths are packaged with ingredients you wouldn’t expect like MSG, autolyzed or hydrolyzed soy protein, calcium caseinate, and more. Yes, they actually put soy in broth. I know, it’s ridiculous. Bone broth contains minerals, collagen, gelatin, and amino acids which all result in loads of health benefits. Warming up a cup of broth is a really comforting drink if you’ve never tried it before. There’s a ton of compliant types you can find at most grocery stores, so many I’m not going to list them all, or you might consider investing in one with added benefits from collagen. 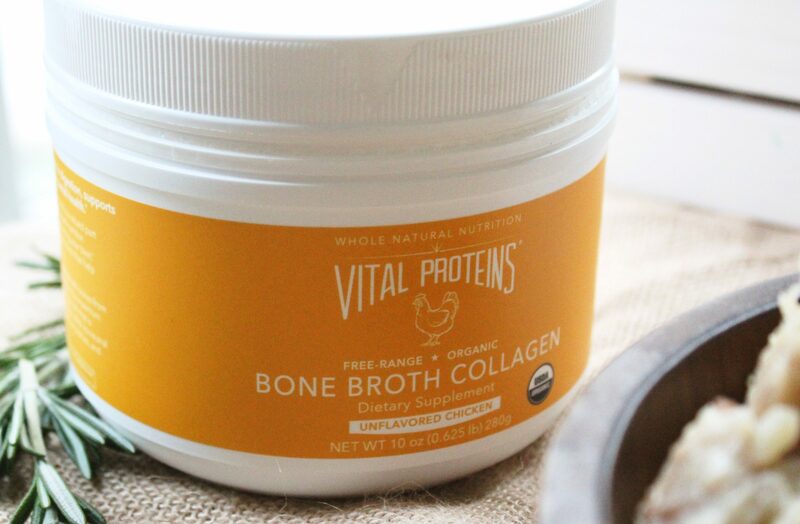 Vital Proteins offers both chicken bone broth and beef bone broth collagen. It comes in powdered form that easily dissolves in water and you can get it in a large canister to last ya a few months, or in individual packets for on-the-go sipping. 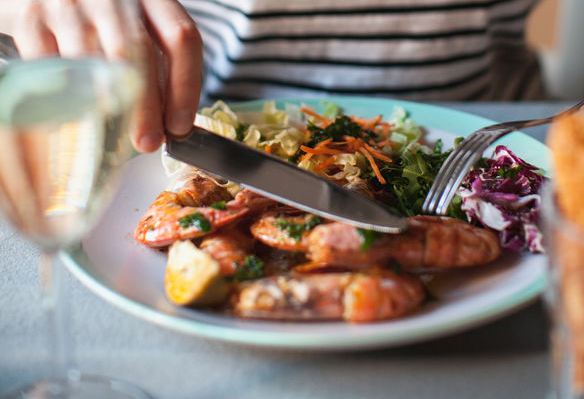 While this is definitely not an exhaustive list, there should be plenty here to get you trying new things and relieving your “water only” boredom. Products are always being developed, and the current ones can change how they’re manufactured at any time, so if you haven’t heard me say it enough yet, check your labels! 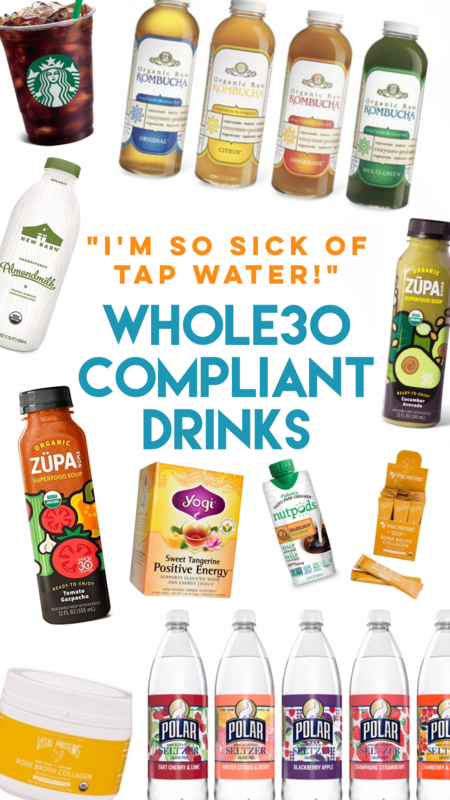 If you love or know of any other Whole30 compliant drinks that aren’t on this list, make sure to let me know in the comments so I can add it in! Enjoy and best of luck with your next round! I am planning on a January Whole 30. I JUST bought a multi pack of Naked Juice from Costco and don’t want to get rid of it or have it spoil. Can I consume it on the Whole 30 as Fruit/juice is now allowed?